When the brain is exposed to music, it comes alive with energy. According to brain scans performed by the Center for Music Therapy, almost every portion of the brain is awake and processing when a person is exposed to music. Portions of the brain dealing with concentration, memory, vision, and even spatial awareness are all in motion when music is playing. An awake and alive brain is beneficial for anyone, but people in recovery from a drug or alcohol addiction might get key rewards from music stimulation. People like this may have subtle brain damage caused by addiction, or they may be accustomed to life with a mind sedated with drugs. Music therapy could help to awaken, engage, and heal the brain – and that could help the person to feel quite a bit better. Any form of music could be used in music therapy. 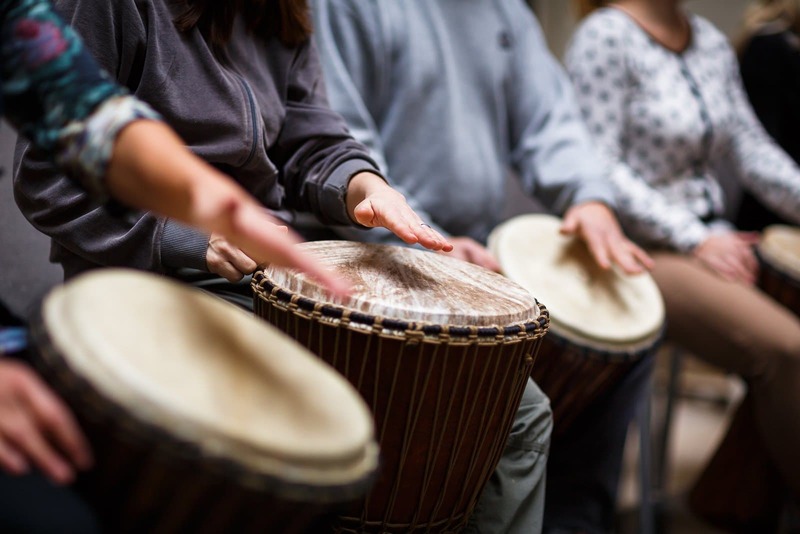 Classical music, jazz, rock music, ambient tones, and even simple drumming have all been used successfully in music therapy sessions. The only real requirement, per an article in Psychology Today, involves culture. Music that comes from the culture of the person in therapy tends to be more effective than music from another culture. 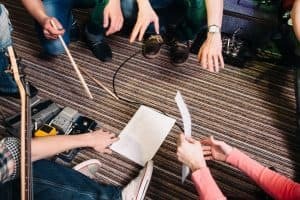 The website Careers in Psychology suggests that a typical music therapy session involves several different types of music. A client might spend time listening to music, then playing an instrument, then playing a different type of instrument. During and after each musical activity, the therapist tries to tease out greater meaning from the music. People might be asked to discuss their thoughts, memories, opinions, or feelings. Through these conversations, they might be more likely to draw connections about how they feel and how the music brought those feelings to the surface. A music therapy session might last for an hour or so, but the work does not stop when people walk out of the treatment area. People engaged in music therapy are typically asked to do some kind of music homework as well. They might be asked to play an instrument, listen to music, write lyrics, or do some other structured activity outside of class that they can discuss during the next session. The American Music Therapy Association (AMTA) says the goal of music therapy is to help build relationships, so people feel more comfortable addressing issues they may not be able to address in conventional talk therapy programs. In other words, when it comes to substance abuse, music therapy is designed to bring a therapist and a client close together, so they can discuss the trauma, the history, and the course of an addiction. With that relationship firmly in place, they can use the language of music to develop solutions for those problems. Then, together, they can heal. 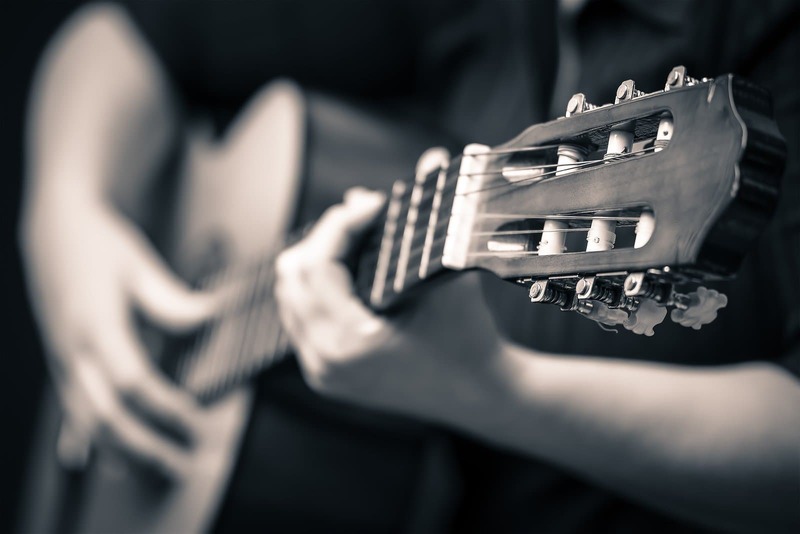 While the general goals of music therapy involve connection and communication, there are secondary goals associated with the therapy that might come with specific, tangible benefits. For some, those benefits have to do with anxiety. For people with a history of addiction, anxiety can stem from a form of brain cell damage caused by drugs. That anxiety can keep them locked in a cycle of drug abuse. Breaking this cycle involves finding a new way to deal with nervousness when it appears. Music may help. In music therapy, instructors may help their clients to use music as a form of distraction or meditation. With music, they could keep calm, and that could keep them from relapsing to drugs. Music may also help to heal feelings of pain or sadness. For people with addictions, those feelings may stem from trauma or poor decision-making. When the feelings arise, people may not have the ability to cope with them. Drugs seem like the only option available. A therapist may help people to explore these difficult emotions through music. The music takes people back to a different time. When that memory has been awakened, the therapist can help the person to discuss the issue in a meaningful way. Similarly, a study in The Arts in Psychotherapy, researchers report that people with a history of substance abuse sometimes have trouble experiencing any emotion at all. They have what clinicians call a flat affect, caused by brain cell damage. They are neither happy nor sad, unless drugs are available. Music therapy can awaken those lost feelings, allowing people to experience emotions they could once tap only if they used drugs. While these possible benefits seem enticing, some people rely on clinical studies in order to prove that a therapy is truly beneficial. These people want a little proof before they dive into a therapy they have never tried before. Unfortunately, according to a 2008 study published in Substance Abuse, no study-based consensus about the efficacy of music therapy in addiction exists. Researchers have been examining specific benefits of the therapy, and many new studies are underway, but there is no official study that definitively proves that this form of treatment is universally helpful for people with a history of addiction. But smaller studies do suggest that the treatment has the ability to help at least some people who have an addiction. 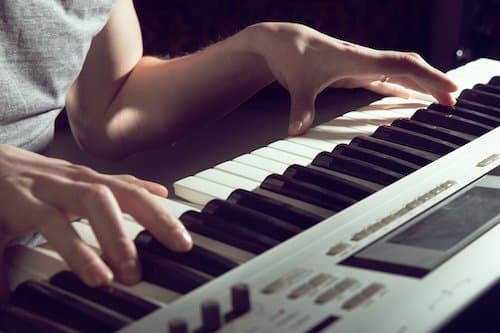 For example, in a study in Drug and Alcohol Review, researchers examined how music therapy might entice people to become more active in their traditional therapy sessions. 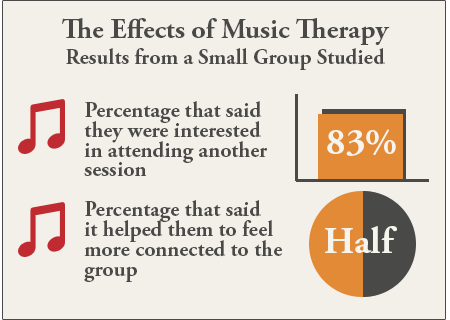 Of the small group studied, 83 percent said they would be interested in attending another session, and nearly half said that music therapy helped them to feel more connected to the group. This study seems to suggest that music therapy really does help people to open up and communicate. When they do, they might get a little more out of the traditional talk therapy sessions they attend. Similarly, in a study in the Nordic Journal of Music Therapy, researchers examined how depression might be improved with the use of music therapy. 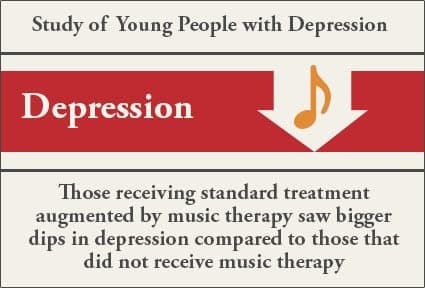 Here, young people with depression were given either standard treatment or standard treatment augmented by music therapy. Researchers found that the augmented care brought about bigger dips in depression. In other words, the music therapy made a difference. This study seems to suggest that music therapy could have an impact on underlying mental health problems that affect people with addictions, such as depression. It might work in a similar way to assist people with anxiety, stress, or personality issues. Most people have some sort of musical device at home. Stereos, computers, musical instruments, and smartphones all have the ability to deliver some kind of music into everyday life, and they are common parts of a modern home. Anyone could, in theory, use them for therapy, but formal music therapy is a little different. People who perform music therapy do more than simply play music or hold music lessons. These people also try to draw connections between the music and a person’s emotional pain, and the connections make the therapy worthwhile. People must have special training in order to make those connections. 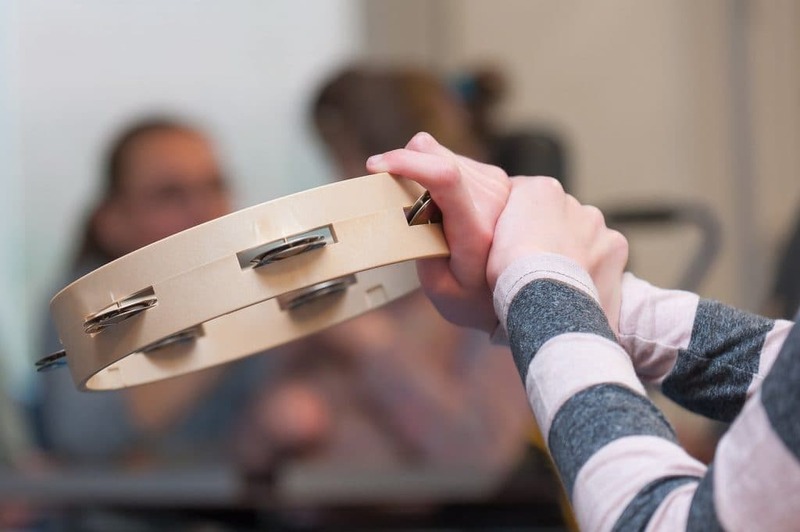 AMTA says there are more than 70 approved music therapy programs that can prepare students to sit for a national exam held by the Certification Board for Music Therapists. Typically, a music therapist has at least four years of schooling before holding even one therapy session. Before agreeing to enroll in a music therapy program, people should ensure that the clinician has the proper training and credentials to do the work the right way. Otherwise, all the benefits of the therapy may not come to pass. While the help of a music therapist can be vital during rehab, this person may no longer be readily available when the program is complete. People move out and move home, and they may need to take a greater role in their own care when they get home. That doesn’t mean, however, that music therapy cannot be a part of a person’s life after treatment. In fact, music can still be a powerful motivator for recovery after rehab. For example, people might learn to keep a portable music player on hand for stressful situations. If that player is loaded with soft, slow, soothing music, it could be a vital tool when a stressful situation appears. People can cue up the right music and listen to it, finding peace within the notes, rather than leaning on drugs for relief. Similarly, people who feel sluggish and slow in the morning, who might typically lean on stimulants for a pick-me-up, can learn to tune the radio to an upbeat morning station and dance along to the tunes played there. This form of music and dance therapy could get people moving, without the need for drugs. People who have the ability to play a musical instrument could use that skill to help fill the time once taken up with drugs. They could join a local band, devote an hour per day to practice, study videos of famous people playing, and try to learn new pieces of music. This hobby can keep them connected to their creativity, and their community, and that could keep them away from drugs.